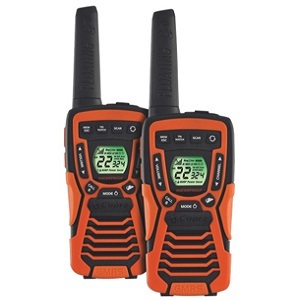 The Cobra CXT 1035R is the perfect handheld walkie talkie for any outdoor activities. It comes pre-charged so you can use it straight out of the box, the second it arrives. The CXT 1035R has a compact design with bright colors making the unit easy to find when dropped in snow, water, or woodlands. It’s body has rubber edges and sides, making the walkie talkie not only gives more grip when it gets wet during a rainy day, or water based activity, but it also acts somewhat as a shock absorbent on impact when dropped. This walkie talkie really impressed us when it comes to being robust. We felt like we could drop it from great height and it would come out working like a trooper afterwards. 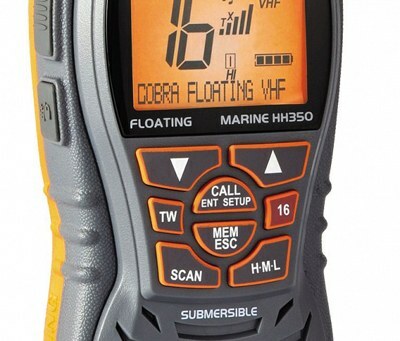 The Cobra CXT 1035R meets the JIS7 (IPX7) standards, meaning it can stay submerged under the water surface up to 3 feet, for 30 minutes long. We should add here that while the walkie talkie can stay underwater, this doesn’t mean it has to. The CXT 1035R has a floating design and is easy to retrieve off the surface of the water whenever dropped. Like most Cobra models that came out in the last 2 years, the CXT 1035R features the BURP function, which with a quick vibration spits water out of the grille of the speaker, making sure you can both hear and use the Cobra CXT 1035R from the second you pick it up. The Cobra CXT 1035R has an advertised transmission range of 37 miles.This range should be enough to always keep in touch with the members in your group during outings such as camping, hiking, skiing and pretty much anything else you can think of. It’s UHF/FM transmission provides extremely clear reception over a long distance, equipped with it’s 2 Watt transmit power. Like most handheld walkie talkie models of this price range you have the option to choose from three transmission power setting including low, medium and high, to either increase transmission range, or to save on battery life. The handset has access to both FRS and the higher powered GMRS. Upon its release we have heard reports of bad audio quality, but have not been able to reproduce any problems others have had. Our audio quality has been great, and actually one of the main points of why this walkie talkie is featured in our top 5. We suspect that Cobra has addressed these issue after release, and updated the speaker set on the CXT 1035R. We know that with waterproof bodies occasionally air could get trapped inside speakers, but upon inspection, the casing of this handheld walkie talkie does not have this issue, as the BURP function clears out any still water and air. 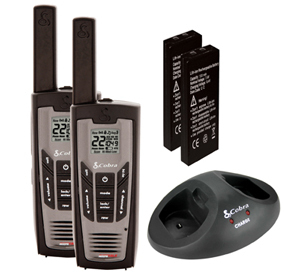 The Cobra CXT 1035R offers 22 channels and 121 privacy codes. The 121 privacy codes include 38 CTCSS and 83 DCS meaning that there are a total of 2,662 channel combinations you are able to use. This incredible amount of options means you and your group should have no issues finding a channel to use without being interrupted by anyone else. This handheld walkie talkie has a reasonably long battery life due to the battery saver circuitry. This feature will switch the walkie talkie into an energy saving mode when no transmission has been detected for over 10 seconds. You can find battery level information on the Cobra’s LCD display. When the battery gets low, you will get an alert to either plug in a charger, or to switch to alkaline batteries. Just like the Cobra MR HH500 marine radio, this handheld walkie talkie comes with the rewind-say-again feature which allows you to replay the last 20 seconds of received transmission. This is incredibly handy in cases where you either missed a call, or for some reason didn’t understand what was being said. The VOX (Voice activated transmission) allows you to use the CXT 1035R hands free, which means you can use your hands for other tasks while answering calls at the same time. 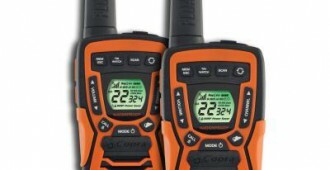 This makes this walkie talkie especially appealing for mountain climbers, skiiers or sailors. Additionally, the CXT 1035R has a speaker/microphone jack, meaning you can add on an earpiece and keep the device safely in your bag, or on it’s belt clip. Additional features include VibrAlert, which can put the radio in vibration mode for activities where the incoming message bleep might be intrusive and a keypad lock, which prevents accidental transmissions of channel changes. 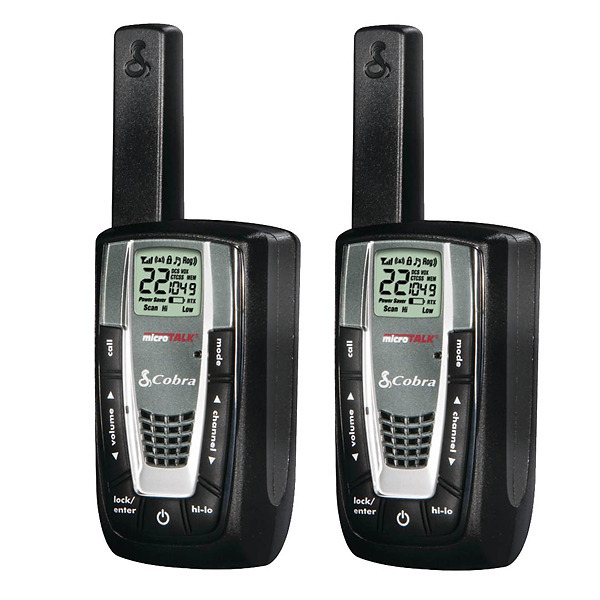 The Cobra CXT 1035R is equipped with a built in NOAA weather & emergency radio receiver with a total of 10 NOAA weather channels being available. The NOAA weather & emergency radio receiver will keep you updated on the latest storms and emergencies so you will never get caught in a bad storm. As well as all the weather channels and alerts, the CXT 1035R comes with a LED flash light at the bottom of the radio, providing some light during low lit conditions. It’s also possible to transmit SOS signal with this light, which can be helpful when you encounter a problem. Overall, Cobra CXT 1035R handheld walkie talkie is an all-round great radio. It offers all features we would expect from a walkie talkie in this price range, and it has quite a few additional features we wouldn’t ordinarily expect like tri-watch, memory channels and keystroke tone signals. It’s an extremely durable walkie talkie that can withstand most extreme weather conditions, and harsh impacts. The CXT 1035R comes with an array of accessories like a micro USB charger, a dock charger, a car charger and six pre-charged AA NiMH batteries to make sure you can use this product right out of the box. 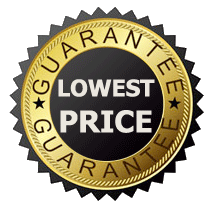 Click here to find the best price! We are so impressed with these roadis that we bought a second set the clarity of the voices is so much better than the old Magnavox roadis we had before. We got these primarily to go skiing with so the family can stay in touch. We haven’t had a chance to use them for that, but we have tried them out. My husband drove down our road approx 2 miles from the house and we had no problem hearing each other. They are easy to use. We predict these will work great in the mountains skiing.